We have immense expertise in offering precisely engineered range of Magnetic Floor Sweepers. These products help in protecting the tires from screws, wires, nails and various other such objects. Our floor sweepers find usage in various construction sites, landfill roads, foundries, driveways, loading docks, parking lots, truck terminals, airports, shipyards, stadium and race tracks. In addition, these sweepers are highly demanded in the market as these can minimize replacement costs, tire repairing and downtime by keeping the vehicles in service. 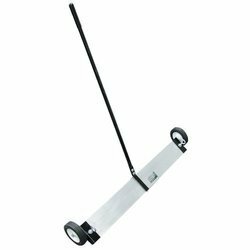 These magnetic sweepers are moved and used over the areas where cleaning is required. Moreover, these sweepers require no skilled labour as these can automatically pick up the loose particles of ferrous material and hold them until the time of load discharging. Manufactured with permanent magnets, these sweepers are offered with lifetime warranty. These non-electric sweepers have nothing to operate and are highly cost-effective. Looking for Magnetic Floor Sweeper ?